YES!! I do hear the Holy Spirit speak and guide me on many occasions...lost things, what to say to someone, how to handle a certain problem...it's a very quiet, calm voice...sometimes I keep thinking it's just me...but the answers I get I know are not ME!! He is so gentle and kind, never pushy...I just pray that I stay still long enough to hear Him so that I am not following me but Him! Your website helped confirm this for me!! His Peace is like a soothing balm...nothing on earth can copy it!! I love this website...thank you. 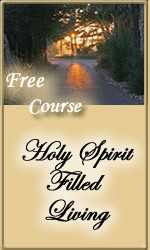 For more on hearing God's voice, see our free Bible lesson on hearing God's voice.